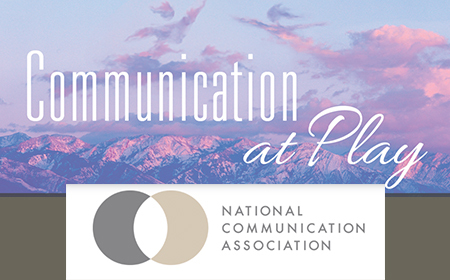 The Department of Communication Studies offers a competitive graduate program filled with opportunity for our students. Our past and present graduate students are the individuals who make our graduate program truly one-of-a-kind. Our graduate courses can unlock the keys to your future. Learn more and plan ahead today! We take pride in the extensive training included in our robust Graduate Teaching Associate program. Have questions? We have answers. We listen to our incoming and prospective students and include answers to some of your most pressing questions. Dr. Ahlam Muhtaseb is the director of CIMES. She co-produced and hosted the well-attended event Syrianamericana: A Nation State of Mind with rapper-poet Omar Offendum on January 29th. 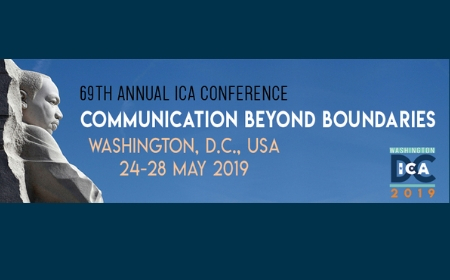 The department wishes to congratulate the Interim GTA Coordinator Carol Damgen, who as Vice-Chair of the Kennedy Center American College Theater Festival National Playwriting Program, will make two large presentations at the Region VIII Festival in Los Angeles. 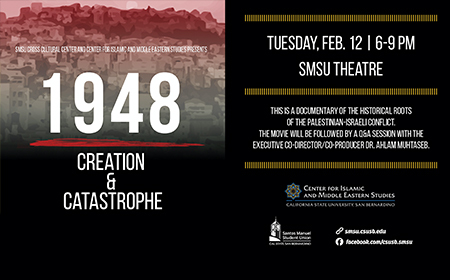 Join Dr. Muhtaseb for a screening of her highly praised film, "1948: Creation and Catastrophe" a documentary of the historical roots of the Palestinian-Israeli conflict. Graduate Student Sean Maulding Accepted to Two Upcoming Research Conferences! Read More about Graduate Student Sean Maulding Accepted to Two Upcoming Research Conferences! Dr. Muhtaseb in Montreal for "1948"
Read More about Dr. Muhtaseb in Montreal for "1948"
Dr. Muhtaseb speaks at the sold out Melbourne premiere of "1948" at the Australia Palestine Film Festival, which is one of 6 Australia premiers. We congratulate her on the success of her highly acclaimed film, the result of over a decade of hard work! Dr. Muhtaseb Quoted in L.A. Daily News! Read More about Dr. Muhtaseb Quoted in L.A. Daily News! Graduate Student Ariana Cano Takes Top Prizes for "Cultural Value in Instant Messenger"
Read More about Graduate Student Ariana Cano Takes Top Prizes for "Cultural Value in Instant Messenger"
Professor Donna Gotch and Dr. Julie Taylor with our graduate students at the WSCA Graduate Programs Open House, where students in our graduate program provided information and personal insight for interested attendees.